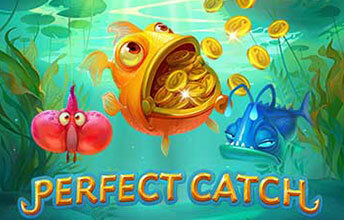 Perfect catch is a 5-reel 20 pay-line slot from STHLM gaming. At first glance this looks like a fairly standard game with not much to recommend it. Play a while though and you’ll find hidden depths (no pun intended). There are 5 special symbols in the game. Yes, the one that looks eerily similar to a part of the male anatomy. 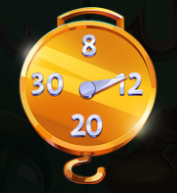 This one will reward you with a Win Multiplier between 2-5x and will then transform into a Wild symbol. This yellow fellow will grant you an extra win. The win will be between 1-25x your bet. The fish will then turn into a Wild symbol. 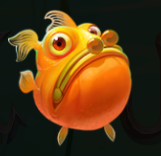 This grumpy looking chap will reward you with additional wild symbols. You will get 1 or 2 extra wilds on the reel where it lands. The fish will then turn into an additional Wild Symbol. It’s a Wild Symbol. Nothing fancy. You will see a few of these though. Perfect Catch Bonus Trigger symbol. Landing this one on the 5th reel will trigger the bonus round. You’ll receive 8, 12, 20 or 30 free spins. 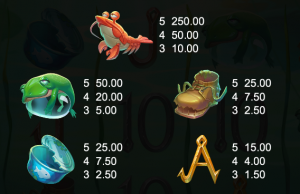 The Catch Free Spins gives an enhanced reel set with more chances of landing the special symbols with each spin. The trick to the game is of course to land as many of the symbols as you can on the reels at the same time. Pull that off and you can win big. That’s why you shouldn’t be put off by the seemingly low payouts on the top symbols below. It looks good, it’s going to get plays across the board. We’ll revisit this review when we’ve spent more time on the game. I think we’re going to play a fair bit of this though. As soon as we have a big win from our Streaming sessions we’ll post that here too. You can join us on any of the below Streams from 2 or 5 pm every weekday!